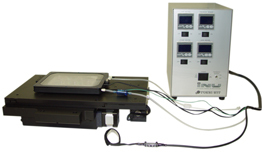 The WSKM Incubation System is specifically designed to work in conjunction with the Prior ProScan H117 flat top stage. The system places the sample in the proper focus position to provide maximum microscope functionality.The WSKM Incubation System provides a compact, long term stable environment for live cell imaging. The WSKM ?chamber unit is set up to handle various types of microtiter/well plates from six wells to 96 wells. Other applicable dishes including 35mm, 50mm and 60mm petri dishes, chamber slides, and chambered cover glass can be used by purchasing adapter inserts.